Often overlooked culprits are the air handlers. At the heart of any mission critical facility, air handlers are usually running 24/7. Those big units are turned on and chugging away more than your lighting and chilled water system are. So if air handlers are a major source of inefficiency, why aren't we doing more about it? When I walk into a building, whether it's a data center, hospital, manufacturing plant or dorm building, and I take a look at the mechanical rooms, I usually see dirty, old, loud air handlers full of holes. Holes of all sizes: 1/4 inch holes from old gauges and probes, 2" holes from old piping or conduit, I've even seen 3" diameter holes from an old CW line that had been removed. And these holes are often left unpatched and leaking air. That air leakage is happening 24/7/365. Operating budgets are often some of the first to get the axe, so it's no surprise than light bulb replacements and fan motor changeouts take priority over patching holes in an old air conditioner. But still, those holes could be improved by a little piece of duct tape. It's not perfect, but it's better than an air leak. Do you hear that loud whooshing sound? It's the sound of the air rushing out of your energy efficiency program. Many organizations have set energy efficiency goals and formalized them into a mission statement. Something like: "To reduce energy consumption by 25% in 10 years." Sound familiar? Your goal may be higher, and your timeframe may be much shorter. The heat is on. So, once you've changed out your fluorescents for LED bulbs, put active sun shades on your windows, and installed low flow toilets, you might have found yourself scratching your head wondering "what can I do next?" A tube of caulk and some duct tape go a long way when it comes to meeting your energy goals. Here's a quick exercise that might get your efficiency juices flowing: Take a few minutes on your lunch break and walk up to your mechanical rooms. Bring the caulk and duct tape; you're going to need them! You're looking for holes in your air handlers and ductwork. Big holes, small holes, it's all fair game. Now, there is definitely a right and wrong way to patch holes, but considering they've been there for ages, leaking, caulk and duct tape might not be such a bad method. You're doing a good thing by plugging them up. Congratulations! You just made your building more energy efficient! Fixing holes in air handlers and ductwork is a good way to get a boost in energy efficiency, but often, the problem is more deep-rooted than that. Often, the air handling unit itself is leaking due to poor design and construction of the unit structure. Most new factory units, even top-tier units, leak 1%-3% from the factory. A general rule of thumb that's been tossed around is for every 1-2 years in service, an air handler leaks an additional 1%. If your air handlers are over 10 years old, they may be leaking 15% or more. That is a significant efficiency loss! If brand new units don't have holes in them, why do they leak so much? 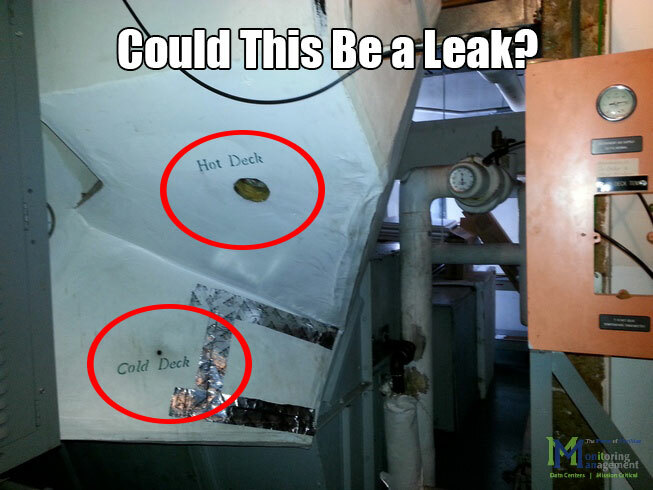 Air can leak from joints and rivets, and it's impossible to stop 100% of the leaks. The goal is to minimize them. Joints in the base, panels, roof, doors and access panels should be well-formed and sealed with gasketing, foam or a butyl sealer. The use of strong, tight, well-formed joints can reduce air leakage to less than 1% of total design CFM. Beware: A reliance on additional caulking during test & balance or commissioning should not be "par for the course". This is usually a sign of poor unit design and construction. As a facility manager, see if your air handling unit manufacturers will guarantee an air leakage rate. In our experience, we have even seen some owners get efficiency guarantees from the AHU manufacturer, with monetary damages if the units under-perform guaranteed efficiency and leakage rates. Some of the best air handling units I've seen are built by Air Enterprises. 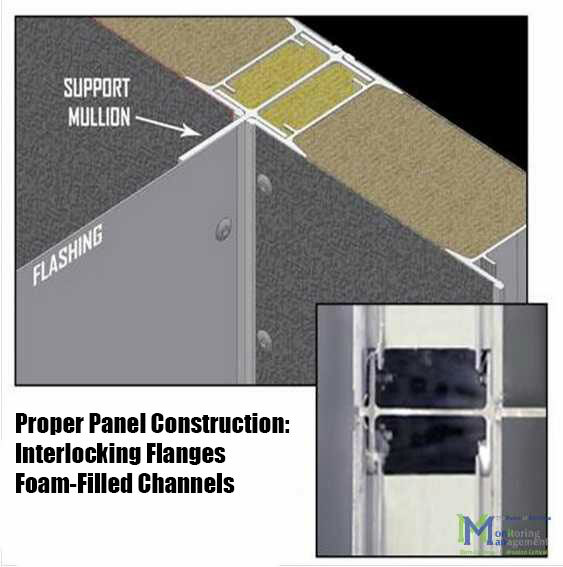 They rely heavily on close-fitting, well-formed panel joints to stop air leakage, without the need for numerous tubes of caulk to fill the gaps. A guaranteed air leakage rate of 0.5% or less sweetens the deal. So the next time you revisit your energy efficiency goals and need some inspiration, think about those old air handlers! It may be as simple as patching holes. If your AHUs are old and have had several components replaced several times already (fans, motors, coils, humidifiers) you might want to think about an air handler changeout. Even in hard-to-reach, tight spaces, new air handlers can be installed to increase CFM and cooling while minimizing efficiency losses. For more information on the brands mentioned in this post, please visit our website. MonMan is a Division 09, 15 and 16 firm specializing in efficient products for mission critical facilities.